Tis the season for pumpkin everything! Pumpkin lattes, pumpkin pies, pumpkin Oreos. Yes, those do actually exists, although personally I have never tried them. Unfortunately, most pumpkin flavoured items these days come with an excess amount of sugar and chemicals. That is truly sad, as pumpkin itself is rich in vital antioxidants and vitamins. So skip the Pumpkin Spice Latte at Starbucks this year (which actually doesn’t contain any pumpkin!) and try some homemade pumpkin goodies instead. Why should you eat pumpkin? Well, pumpkin is a vegetable, and who doesn’t need another veggie in their diet? One cup of pumpkin contains 3 grams of fibre and only 49 calories. Did you know that one cup of cooked pumpkin contains 200 percent of your daily requirement of vitamin A? Vitamin A is so great for your eyes – it aids vision, particularly in low light. What gives pumpkin its beautiful orange hue is beta carotene. These carotenoids neutralize free radicals which can help keep cancer cells at bay, and keep skin wrinkle free. I decided to incorporate some pumpkin into one of my daily breakfast staples, oatmeal. For me, oatmeal never gets old as there are endless ways to spice it up and change its flavour. Pumpkin pie oatmeal is perfect on a chilly day. I like to drink a super-food smoothie right after I workout ,and then around an hour later I am ready for my oatmeal. So I don’t know if oatmeal is technically part of my breakfast or should be considered a mid-morning snack! Either way, I love it – it is delicious and satisfying and keeps me full until lunch. In a small pot, combine all ingredients, along with 1 cup of water. Stir well. Cover and bring to a boil on medium/high heat. Once boiling, reduce to a simmer and uncover. Cook for around 10-15 minutes, stirring often. You may need to add more water – keep an eye on it. When oatmeal is tender and all the liquid has been absorbed, you are done. This dish can be refrigerated in and individual servings can be scooped out throughout the week and reheated as necessary. Just add a bit of liquid and warm in a small sauce pan or in the microwave. 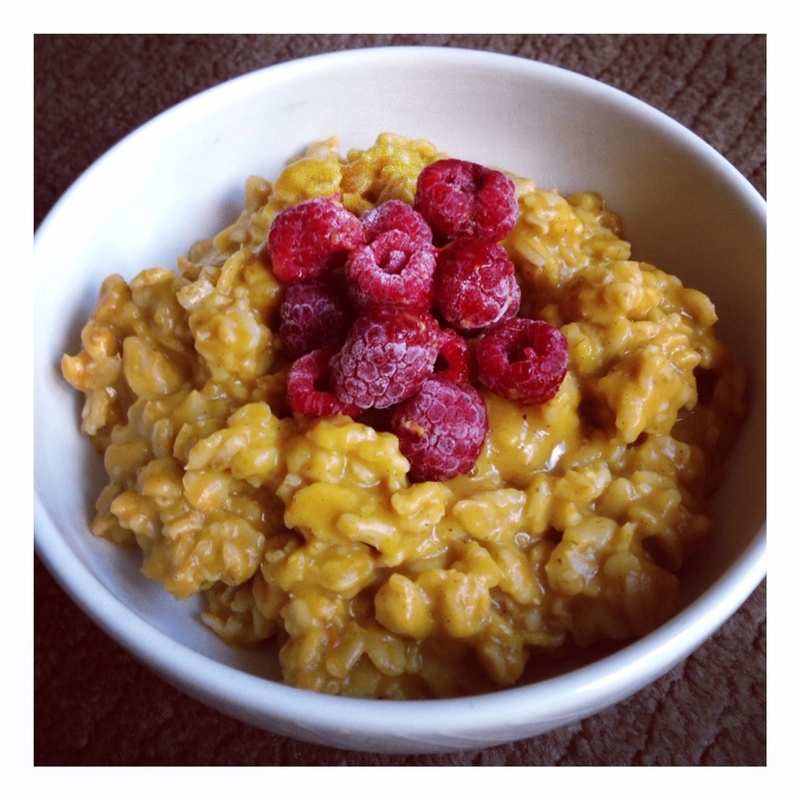 I like to top this dish with raspberries – I used frozen and the cool tart flavour of the raspberries perfectly balances the warm creamy pumpkin oatmeal. What is your favorite way to eat oatmeal? Please comment below and let me know! Categories: breakfast, glutenfree, oatmeal, pumpkin, Recipe, Vegan | Tags: glutenfree, Oatmeal, pumpkin, Pumpkin pie, pumpkin puree, Pumpkin Spice Latte, Recipe, vegan | Permalink. Preheat oven to 350. Mix together oats, Chia Goodness, banana, apple, cinnamon and salt in a large bowl. Add water, maple syrup and vanilla. Stir well. Pour into a 2L baking dish. Set aside. Chop walnuts. Add in oats, coconut sugar, maple syrup and Earth Balance. Mix well. Sprinkle over oatmeal mixture in baking dish. Bake for 25-30 mins. It will be done when the water has been absorbed and topping is golden brown. Serve warm, and ENJOY! Makes 8 servings. I had three (small) bowls of this immediately after I took it out of the oven. I figured why not – it is full of wholesome ingredients, and I with the half-marathon training I am doing, I can use the extra carbs! 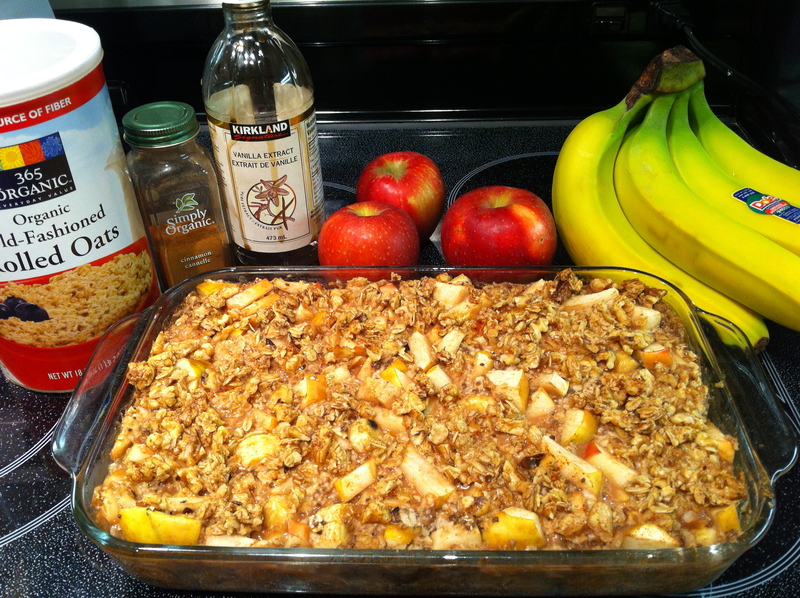 Have you ever tried making baked oatmeal? What are some of your favorite oatmeal toppings? Categories: Baking, Gluten free, Vegan | Tags: Baking, Gluten free, Oatmeal, Running, vegan | Permalink.